This is the ThruNite TC20 flashlight , sent to me for review by ThruNite and NO other compensation other than me keeping the light. 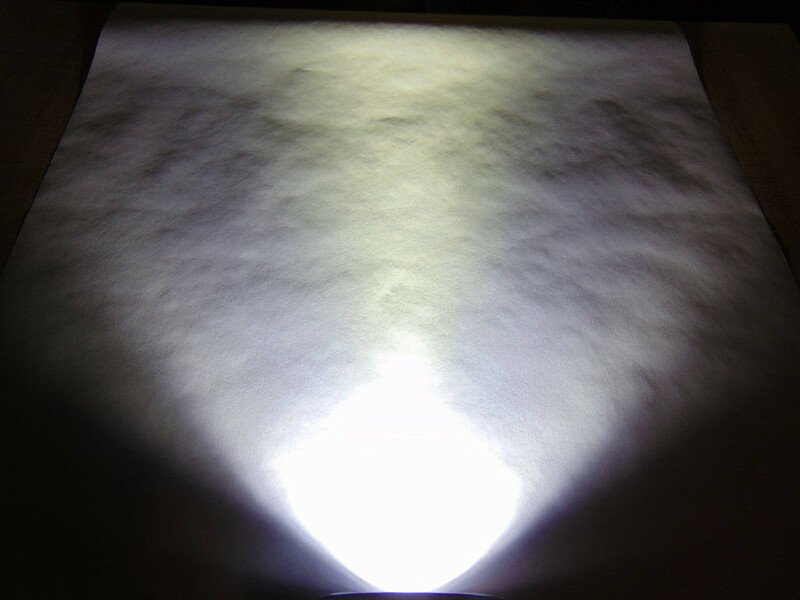 There is a 20% discount until January 31st using code TC20 on the main site……..
Light can also be found on Amazon………. The TC20 arrived in an Amazon box with large bubble wrap and the ThruNite box inside that. Everything was well packaged and the Thrunite box and contents in perfect condition when I received the light. As I have come to expect with the ThruNite products the TC20 just made me think quality as soon as I pulled it from the box. A very compact , yet robust feeling light as soon as it is in hand. The package includes the TC20 itself , 5000 mAh Thrunite protected cell , Nylon holster , extra O-rings and USB charging port cover , the charging cord , as well as the silicone piece that goes under the switch (incase it ever wears out) instruction manual and thank you card. The light is a very compact , single 26650 , and one of the smallest I know of out there in the form factor of XHP 70.2 and the single 26650 cell. On the outside of the light as mentioned , everything about it just says quality. The knurling is very well done and very grippy , the Anodizing is near flawless , bezel is well made and machined and the overall finish is just great. The OP reflector is a heavy aluminum one with just about the right amount of texture to it (for my liking at least) and it is also machined very well. The reflector sits behind an AR coated lens that was almost invisible when I first took the light from the box. The Side Switch is a very nice metallic switch and is the only switch on the light , controlling all functions. There is a light in the center of the switch that is an indicator and it comes on when the light is powered on , other than in the moon mode , with a blue light showing. The lighted switch also serves as a Low Voltage indicator and will turn Red when the cell starts nearing depletion. The same switch light is a charging indicator as well and shows Red when charging and then turns Blue once the cell is fully charged , using the USB charging port. If the cell is placed in the light reversed , or if there is another problem with the cell inserted , the indicator light will be blinking and show Purple to let you know something is wrong, or “improper charging”. The USB charging port is located on the opposite side of the switch and seems to be pretty well sealed when the rubber boot is properly in place. The listed amperage on the side charging port is 2 Amps , but I have not tested that. The UI is a pretty simple one and has pretty good spacing between the modes to suite me. A long press from off will get the Moon mode , a press of about 1/2 second takes you to each “next” level of Low / Medium / High and then a quick double click gets you to the Turbo mode. The strobe is accessed with another quick double click from the Turbo. You can get the Turbo mode also from any other mode , including off and a quick click of the switch turns the light on or off. There is mode memory for the Low , Medium and High modes. The tailcap springs (yes 2 of them) are 1 smaller spring in the center of the board as we are used to seeing and the other spring is a heavier gauge wire and much bigger in diameter. The Larger spring is a little less stiff than the center spring , so it allows the larger spring to compress easy when the tailcap is screwed down so that both of the springs are making contact and therefore helping carry the current without need for a spring bypass. The threads on both ends of the tube and also the head and tailcap are all very well machined and square cut and all were lightly lubed. The XHP 70.2 emitter sits perfectly in the middle of the large opening of the reflector and the MCPCB is screwed down to the shelf with 2 small screws. The smallish sized light handles the heat better than I thought it would from the XHP 70.2 emitter making all those lumens also. It does get hot by the time the light steps down , but not like instant blister you hot if you touch the head. The beam from the TC20 is a good mixture of throw and flood both , giving a very wide coverage area for such a small light and reflector , but at the same time it will put good light well downrange also. 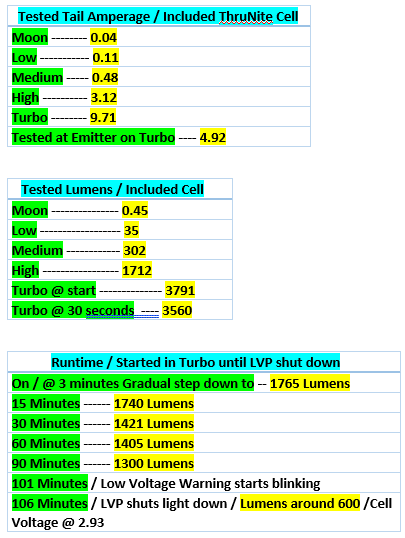 The charts on the Lumens and amperage testing I did with the TC20 ………. The driver , best I can tell , is a Boost driver with constant current. I have not gotten the driver out of the light yet as it seems to be either well glued or press fitted very tightly , I may revisit that at a later time. If I do decide to get the driver out of the light later I will update this thread at that time. I personally am very pleased with the TC20 in the fit, finish , feel and overall performance of the light. For those who may not want to see the whole video , but would like to see the outdoor “Live Footage” and comparison , The rest of the still shots of the light and beamshots start at 9:48 of the video timeline and the outdoor footage starts at 13:25 of the timeline. Video Followed by listed specs…………. •LED: CREE XHP 70 2nd gen. with a lifespan of 20+ years of run time. •Compatible with: 1 × 26650 (ThruNite 26650 5000mAh). •Working Voltage: 2.75 – 4.2 V.
•Peak Beam Intensity: 25580 cd. (max). •Max beam distance: 320m (max). •Weight: 148g without battery. .
•Dimensions: 119mm in length x 42mm in head diameter x 33.5mm in tailcap diameter. Good review Robo, the spill seems huge. 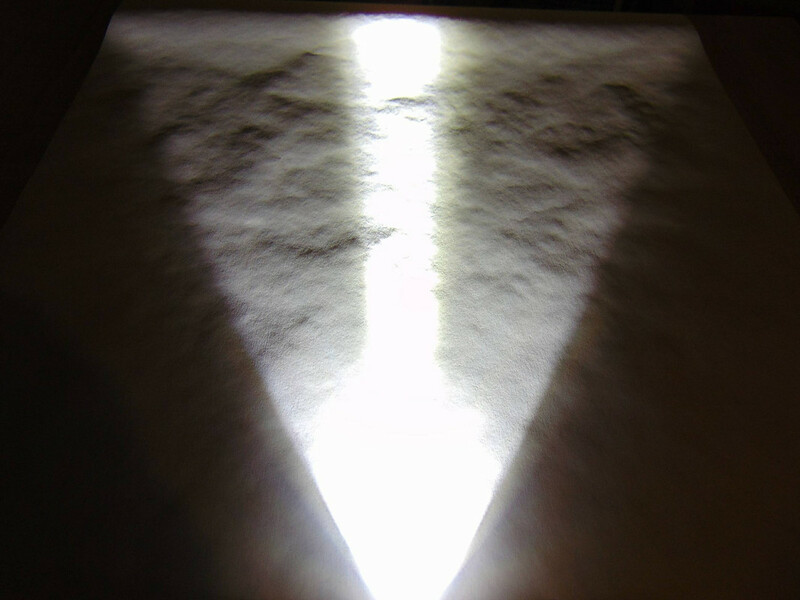 May you compare to another light like vg10 the beam angle? Yes it is very compact to have the XHP 70.2 and the kind of coverage area it does. Unfortunately all 3 of the VG10’s I have are modded out with either dedomed emitters or XPL-HI in them , but I went ahead and got a shot of the one with the HI in it that is pictured in the review . as well as the Olight X7 Maruader with the triple XHP-70 emitters in it to show the beam profile. Sorry to hear that…maybe they will work on getting world wide shipping in place for their products soon. I just compared the beam also to the L6 and the S70 , it is a little wider than both of those. Thanks Robo for the great review. I’ve been waiting for someone to review this flashlight for awhile. The beamshot angle was especially useful. I was actually hoping the light would be wider angle with more flood than it is. I was debating to either get this light or the much larger Haikelite M09R. I’m thinking I will go with the M09R as it seems floodier. I am not familiar with the M09R but the little TC20 does have a pretty good coverage area , especially for the compact size it is. If you can go to the video and watch beginning at 13:25 you can see just how well the small light compares in coverage to the much larger Olight X7 with the triple XHP 70 emitters and that one makes a wall of light. too bad there is no group buy. Not sure I have ever even seen ThruNite do a GB though. Thanks for the review and video, I was waiting for this here and also on YT. I really enjoyed watching it on my 50” TV relaxing on the couch! Again I loved the “Rock out” slideshow segment! Also a very helpful photo right here, the X6 is enormous!! 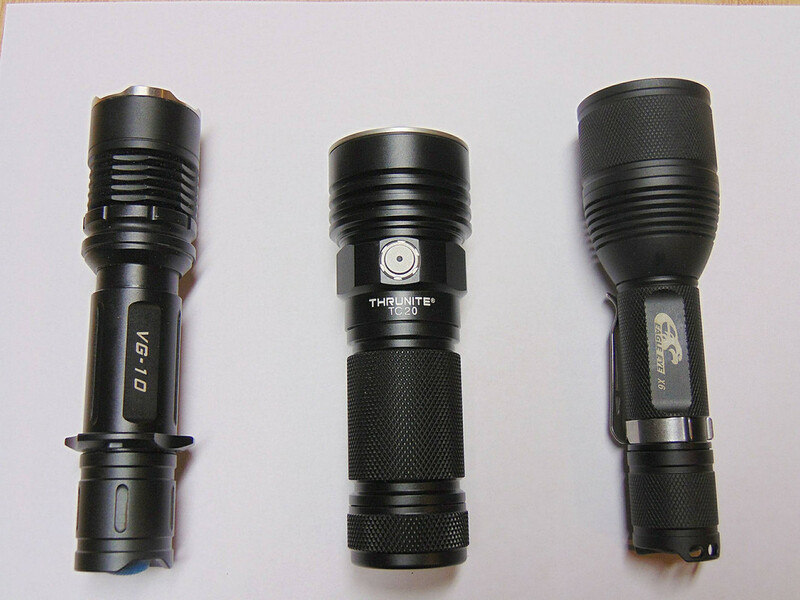 The Olight R50 pro looked slightly brighter to me, also interesting the TC20 has a colder tint than the R50 pro. You’re welcome and Glad you enjoyed the review. It was the Olight X7 Marauder I used to compare though and I went to the Turbo 1 setting with the X7 which is around 5500 lumens compared to the TC20 at around 3500 lumens at that point. As far as the tint they are pretty close really in person but the X7 has a much larger head and uses 3 XHP 70 emitters with a broader beam area , compared to the single XHP 70.2 in the TC20. I wish I had a closer comparison but the TC20 just doesn’t have the same beam as any of my other 120 or so lights I have in there believe it or not. All the others are either more floody or more throwy in comparison with most of them being more throwy , other than the X7. Just to give a little better perspective just how small the TC20 is , here are the X6 and the TC20 laying across my hand side by side. Will a 67.55mm flattop battery work in the TC20? Hi robo, can you compare a photo between tc20 and wowtac a3. Thanks. What a stunner. And super compact. Looks like this light is definitely MVP material. But why on earth the generic bland name “TC20”? This light deserves a much cooler name. The shorter cells will work , However I did notice with the flattop unprotected cells I tried , good bump of the tail end or head end will cause a quick flicker. If you do not jar the light hard they work fine though. I quit questioning the names they give a lot of these lights and accessories a long time ago , as some of them get really weird. My light flickers with a good bump even with the included Thrunite button top cell. Thanks for posting this photo, I didn’t know about the A3S before I saw this, I’m highly interested, think I’d like to try that one. Hmmmm……..They extended the sale I guess? No need to hurry, Plenty of time! The TC20 is already $46 less than the EC50 Gen II or Gen III , with both at regular price. With 20% off , or an extra $17 off , the TC20 is hands down the best choice in my opinion , since they are both about equal in size , output and performance. 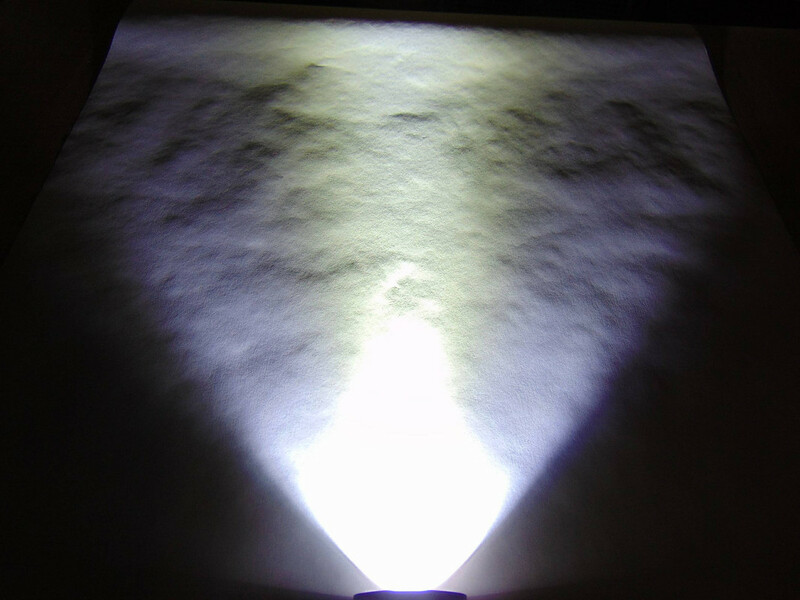 I forgot to mention i received my tc20 in cool white.. its a very good light and Would even consider as a EDC light for me. Thrunite are very reliable and user interface is awesome.. just the way i want it. 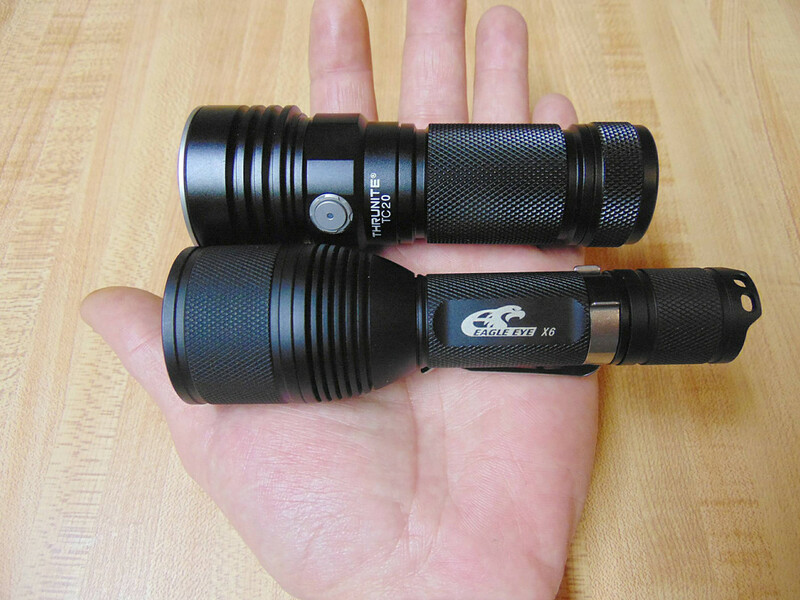 I wish thrunite use 26650 in their tactical light. I’ve always felt $100+ on a single XHP50/70 light with boost driver (single cell) is completely bonkers, no matter how premium a brand is. 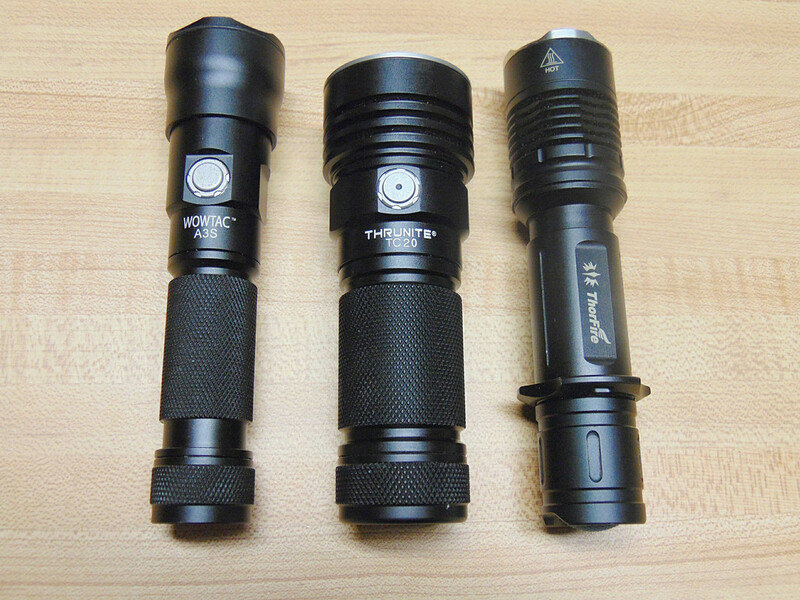 Thrunite’s pricing makes the TC20 a much more lovable light to me.